I've been following charmingcandy on Twitter for a while now. All of the lollipop flavors they've linked from their Etsy store sound and look so very good. After seeing the Celebration Time Lollipop collection, I couldn't resist any longer, and I ordered them immediately. If you haven't ordered from Etsy before, it's a great place to find unique, one of a kind items made by thousands of people across the United States. We often use Etsy to find a great gift for someone we know. 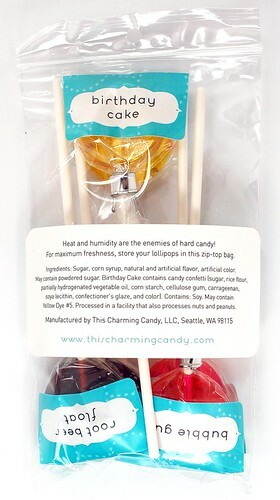 The lollipops from This Charming Candy are a perfect fit for Etsy. Hand-made, unique, amazing quality lollipops made in small batches. Root Beer Float: Smells like root beer as you take it out of the package, looks like a root beer float. It is a brown lollipop sprinkled with powdered sugar to look like a root beer float. If you are thinking this would taste like a Root Beer Barrel or root beer Dum Dum, you would be completely wrong. There is an amazing vanilla flavor in this lollipop that complements the root beer very, very well and gives it a true float flavor. It really makes you think of vanilla ice cream floating in a glass of root beer. This was my 2nd favorite of the group. Bubble Gum: This one was my absolute favorite. Imagine liquifying a package of bubblegum flavored Bubble Yum and putting it into a lollipop, that's exactly what this one tastes like. It is nothing short of amazing in my opinion. I think I liked this one the best because bubble gum isn't a flavor you normally get in a hard candy like this. In fact, it's not a flavor you'd find outside of gum or a unique Jelly Belly jelly bean. I highly recommend this one and enjoyed every minute of it. Birthday Cake: I wasn't very sure about this flavor, but that's only because I'm not a big fan of cake or cake batter tasting candy. This lollipop has a very distinct yellow cake flavor, and while it wasn't my favorite, it was pretty darn good. The sprinkles inside were a very nice touch that shows how This Charming Candy does a little extra to make their product unique. There are several reasons I liked this candy. I enjoy helping a small candy company that makes a unique and extremely tasty product. I like the very different flavors offered for sale and the amazing pictures offered on their site. My lollipops arrived very well packaged with a very nice personal note that I was the first sale, for them, in my state. That was such a fantastic touch you don't get when you buy from a large candy company. The extra long sticks on this candy are ingenious. I've always thought the normal short sticks on lollipops weren't quite right. I also love the amazing texture and denseness of this candy. The lollipop itself feels thick and solid, there's almost no way you could bite into one of these, and I'm not sure you would want to. These are meant to be savored, and as The Charming Candy tagline says, "everyone deserves a 10 minute treat". My wife wondered if, as an adult, do you really want to be seen sucking on a lollipop? My answer, "Who cares? These things taste AWESOME!". Honestly, I love candy that makes me feel like a kid. Candy is meant to be fun and tasty. You really should try these, especially if you are a kid at heart. There are two new ways to order from their Etsy store. They now offer one of their amazing lollipop collections (6 lollipops) per month for 6 months and the ability to buy their items as a gift, with hidden payment and a personalized note. This would make a great gift for any candy fan. This Charming Candy Website and their Flickr photostream with some fantastic photographs of their product. 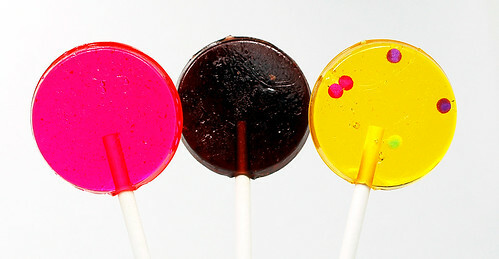 I love the idea of a cake flavoured lolly, very different! It’s nice to companies thinking outside the box. And they are just so pretty too! All 3 flavors were fantastic but yes the cake flavor was so very interesting to include. I would recommend trying them if they ship to other countries (I think your blog says you are in the U.K.?). Thanks for the comment! Luckily to read your article,thank you! I would like to wish you a joyous everyday and express my hope for your happiness and good future.